It's always hard to say good-bye when missionaries come to the end of their service. This time we only had to say good-bye to one -- Elder Mugele. But we are also saying good-bye to Elder Wafula who has been assigned to a different area. He has been an Assistant to the President for 10 months and we have worked closely with him in the office. We will truly miss him. I've always enjoyed his humor and friendliness but also his solid knowledge of the gospel and his ability to lead. At the same time we say good-bye to Elder Wafula, we say hello to a new Assistant, Elder Ellis. It will be good to get to know him. He came on mission just 6 weeks after we did. Relaxing at the Mission Home with a game of Scrabble. 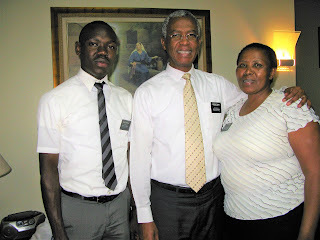 L-R: Elder Mugele, Elder Torrie, Elder Hales. My growing up family played a lot of Scrabble and so did LeRon and I and our kids. In fact we brought a Scrabble game with us on this mission and have not played it even once. No time or no energy by nighttime! And Scrabble games are easily available here. You can even buy them from the hawkers on the streets. Incoming Assistant, Elder Ellis, and outgoing Assistant, Elder Wafula. Elder Ellis is finding that the Assistants do a lot of dishes at the Mission Home! Thank you, Elder Ellis and Elder Hales! President and Sister Msane with Elder Wafula and Elder Mugele. Sister Msane presenting a mission T-shirt to Elder Mugele. Looks great, Elder Mugele! A T-shirt to wear with pride, remembering a wonderful 2-year mission. Elder Mugele with President and Sister Msane. Next day, back in the Mission Office. Elder Ellis's first day as an Assistant to the President. Lots of work! And Elder Musonda is helping me by doing some shredding. "Hmn . . . " says Elder Ellis, "Tall shoes to fill!" Outgoing Elder Wafula and incoming Elder Ellis. Elder Wafula is heading to Kisumu to serve as a Trainer to a new missionary.